In Fall 2005, we offered to assist the search effort by developing a high resolution robotic video system to observe the sky over an extended time period. 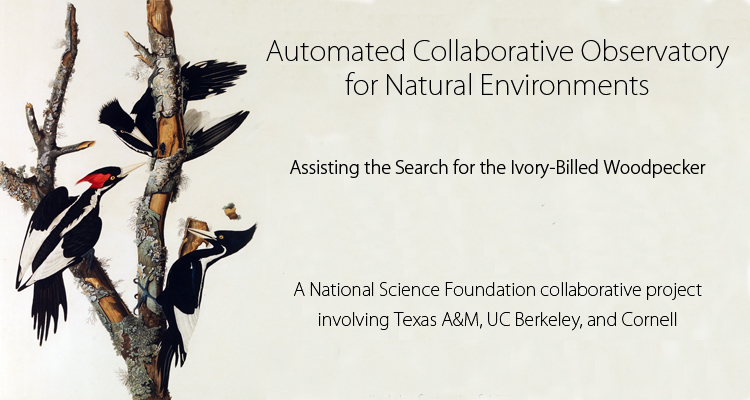 We are now collaborating with the Cornell team and designing a new camera system in conjunction with our existing NSF project to develop collaborative observatories for natural environments. Detailed high resolution video images are required to distinguish an ivory-billed woodpecker from its cousin, the common pileated woodpecker. Our goal is to develop a computer vision system that detects when birds fly into the field of view, recording the associated video segments, and discarding video where there are no birds present. Subsequent analysis by human experts (perhaps with computer post processing) will be required to sift through the Gigabytes of video data collected. The system is to be installed in a clearing in the Bayou DeView, which is mostly swamp. Some challenges are: lack of network connectivity, variations and noise in sky images, limited power supply, high temperatures and moisture conditions. The first prototype Automated Collaborative Observatory for Natural Environments, ACONE 1.0, will incorporate two Arecont Vision 3 Megapixel video cameras and one 1.4 GHz MiniITX computer. We installed the first pair of ACONE cameras in October 2006. Powerline cut, Bayou Deview, Brinkley, Arkansas. Two cameras and one control box. Motion detection, motion classification, and bird segmentation.